Adult tooth loss can be devastating to your oral health and self-esteem. Fortunately, tooth loss is treatable with restorative dental procedures. Dental implants are one of the most popular treatment options for replacing lost teeth and enhancing the smile. Dental implants come in two different sizes: full-sized traditional dental implants and mini dental implants. Dr. Bruno Lemay helps patients understand the difference between traditional versus mini dental implants during consultations at his practice, which serves Rancho Mirage, CA, Palm Springs, CA, and Palm Desert, CA. Schedule a consultation with Dr. Lemay to find out which treatment is right for you. What Are Traditional Dental Implants? Traditional dental implants act as artificial tooth roots that are surgically placed within the jawbone and used to secure a dental restoration within the mouth. Traditional dental implants are small, titanium posts that, when placed within the jaw, bond to the surrounding hard and soft tisues in a process called osseointegration. Once the bone has fully bonded to the implant, a dental restoration, such as a crown, can be attached to replace a missing tooth. In order to place traditional dental implants, there must be sufficient jawbone to support the implant. Because the jawbone atrophies, or dissolves, from long term tooth loss, some people may require a bone graft before undergoing treatment or may be better suited to treatment with mini dental implants. Like traditional dental implants, mini dental implants are small titanium posts that act as artificial tooth roots. Mini dental implants can be used to replace one or more missing teeth. They are especially beneficial for implant-supported dentures. In many cases, dentures may be attached to the mini dental implants during the same appointment whereas traditional dental implants may require recovery time, which can take several weeks to months, before restorations can be placed. In addition, mini dental implants are smaller than traditional dental implants, avoiding the need for a bone graft and allowing them to be used in cases in which traditional dental implants may not be suitable. 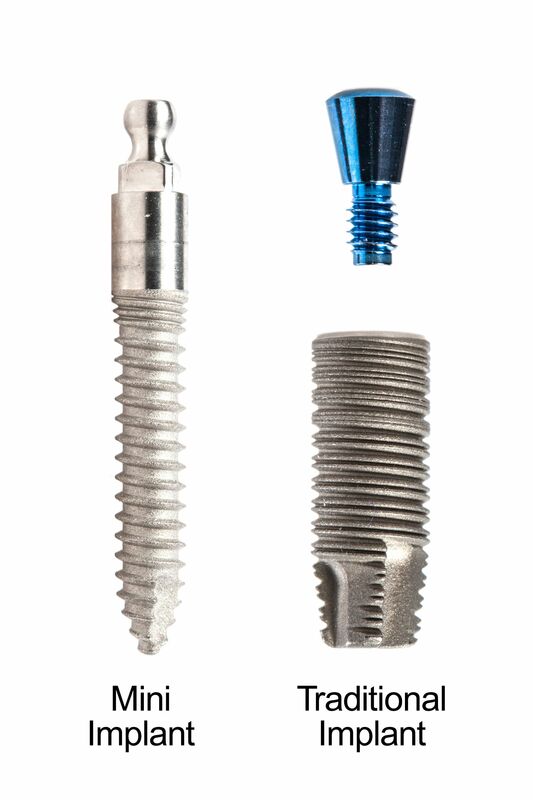 The main difference between traditional dental implants and mini dental implants is the size. Traditional dental implants are generally 3 to 6 mm in diameter. Mini dental implants are about half the size of traditional dental implants. Because of their larger size, traditional dental implants often provide a stronger base for securing a dental restoration within the mouth, but that does not mean that mini dental implants are not effective. Mini dental implants are a great option for replacing missing teeth for those who do not have sufficient bone density to support a traditional dental implant. In addition, recovery after treatment with mini dental implants is typically faster than treatment with traditional dental implants. Both traditional and mini dental implants can help restore dental function and enhance the smile's appearance. To find out which treatment is right for you, we welcome you to schedule a consultation with Dr. Lemay.